You are here: Home / Frequently Asked Questions / What Happens if the Insurance Company Refuses to Settle for an Amount that I Think is Fair? What Happens if the Insurance Company Refuses to Settle for an Amount that I Think is Fair? As I have discussed elsewhere on this website, your employer and their insurance company do not have to offer you any type of settlement. And there is nothing your or your attorney can do to force the insurance company to settle for a lump sum. Unlike negligence cases – like a car accident claim or a medical malpractice claim – you do not have the option of “taking them to court” to resolve an impasse. 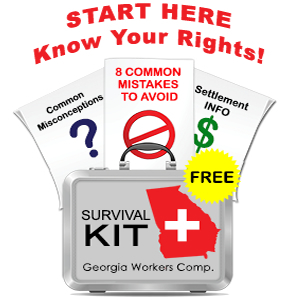 The Georgia State Board of Workers’ Compensation does exist to resolve disputes regarding your claim but the State Board does not have the authority to award lump sums. Our experience has been that insurance companies do want to settle because closing out your case with a lump sum serves the purpose of eliminating uncertainty. If the insurance company does not settle they could be on the hook for dozens of weeks of lost wage (TTD) benefits and thousands to tens of thousands of dollars of medical care. Further, they have to pay adjusters and possibly defense lawyers to monitor cases even if nothing substantial is happening. Insurance companies also have to deal with state and federal law regarding cash reserves. Under these laws, the insurance company has to set aside a certain percentage of its available cash to pay for wage benefits and medical costs that might happen. This is money they could use to invest or to grow their business. If their reserve for potential losses (they call claims like yours “losses”) gets too large, then they could face fines or other actions by state or federal regulators. So, yes, the insurance company in your case has many reasons to want to settle. However, they will only settle with you if the lump sum settlement figure represents a reasonable risk to them. And you should not bring unrealistic expectations to the settlement negotiations. Here’s an example. Let’s say that your TTD (weekly wage benefit) rate is $450 per week and that you have been out of work and receiving benefits for the past 50 weeks. Under the law, the maximum number of weeks you can collect in a non-catastrophic injury case is 400 weeks. So in this example, the most that the insurance company would be at risk of paying is 350 weeks x $450, or $157,500. However, the insurance adjuster will argue that you probably won’t be out of work for another 350 weeks (6.75 years) and she may estimate that you might be out for another 20 weeks (20 x $450 = $9,000. The insurance adjuster will also look at your medical record and conclude that future surgery is unlikely and that the most likely situation for future medical costs will be $10,000 over the next two to three years. And they might assume a “permanent partial disability” (PPD) rating of 5% which would translate into around $10,000. Based on these assumptions, the adjuster may offer us $25,000 to settle. I would likely look at this case differently. I might assume 50 weeks for future TTD, future medical costs of $20,000 and a PPD rating of 15%. I might start negotiations at $95,000. However, if you want to clear (after attorney’s fees) $200,000, it is unlikely that your case would settle because there is no compelling argument we could make for that number. If we went to mediation, the mediator would likely point out the strengths and weaknesses of both our case and the insurance company’s case and help us move closer to a settlement. For example if the insurance company has surveillance of you lifting grocery bags, that would hurt our case. If we have a medical report suggesting that you may need a disc fusion at 3 levels, that would help our cause. The mediator in a case like this may help us get to an offer in the $65,000 to $75,000 range and that might be a reasonable offer given the facts of your case and a reasonable interpretation of the medical record, the tendencies of the doctors involved and many other factors. If you do not agree – and you are always free to reject the insurance company’s offer you could continue to collect TTD benefits until you are released to return to work and then receive a payout of your PPD benefit and continue to treat with the workers’ compensation doctor for as long as necessary. We may decide to send you to a doctor of our choice (at our expense or using the “claimant’s IME” to get additional medical support. But you would also run the risk of your case growing stale. Like fruit and vegetables, even the strongest workers’ compensation case can become stale and lose its value. If the medical record in your case suggests that you are improving or have reached maximum medical improvement, the potential exposure of the insurance company goes down, as will their settlement offer. Insurance companies will also step up surveillance, or send you to an “independent” medical exam if you are out of work longer that what is typical of your type of injury. Or they may simply more to cut you off and force you to convince a State Board judge that you are still unable to work. Having represented several thousand injury Georgia workers over the years, I can offer you my analysis of a range of what I believe to be a reasonable settlement offer, and my thoughts about the whether you have reached the right time to settle your case. As my client, you make the final call regarding whether or not to agree to a settlement. I recognize that this is your case and that you have to feed, clothe and house yourself and your family long after the lump sum settlement dollars run out. I take this responsibility very seriously and I do everything in my power to keep you updated about the progress of your case and about how to maximize settlement value.